Home Unlabelled Guest Post: "Ready for Rollout"
Guest Post: "Ready for Rollout"
I have had students "guest post" on my blog before, but today is the first time that I am having one of my fellow educators composing a post. My colleague's name is Gennevieve Helzer, and she is the Deaf Educator for the Aurora Huskies. Actually, @MrsHelzer is more than a colleague. She is also my neighbor and a great friend. We have some common planning time and her post stems from one of our conversations. Thanks, Mrs. Helzer! It's less than two weeks until we go 1:1 with iPads in grades 6-12. The infrastructure upgrades are done, the iPads are here, the chunky, indestructible covers are installed, and we teachers have oodles of workshops and meetings and trainings under our belts. And yet… there's some unease, some anxiety among the staff. Partly we're just not sure what this is going to look like day-to-day in each of our own classrooms. And partly, I suspect at least some of us have some unspoken fears. 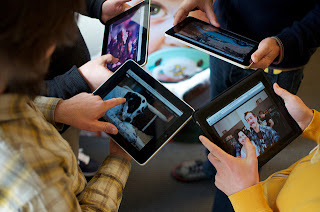 In this new world of connected, student-driven learning, have we become out-dated? Are our skills obsolete? In a school full of well-equiped digital natives with continuous internet access, have we teachers become (gulp)… dispensable? There is a sensation that the students are more comfortable with the devices than some of the staff. There is a general agreement that at times, they will be teaching us. There is an understanding that many of them are already savvy with technology some of us are still learning. But I'd argue that comfortable is not the same thing as competent. Right now, our students are digital natives in exactly the same way they are (well, most of them are) native English-speakers. In our district, most kids come to us in kindergarten already adept at social language. They have been immersed since birth in their native language. Most of them (not all) are curious, excited to learn, and willing to experiment and make mistakes as they master new words. They delight in word play, jokes, and puns. They are brilliant, innovative, and flexible in their use of their native language... but they are not necessarily purposeful and conscious in their use of it. They are fluent, but they have not fully mastered it. So in addition to vocabulary in all subject areas, we spend thirteen years teaching them English grammar, discourse, and appropriate register. We expose them and coach them to use their native language for learning, not just social purposes. We explicitly teach them to expand, shape, and retrieve knowledge, to monitor their comprehension and become critical thinkers. We know how to do this, and we're pretty good at it. Throw a few hundred iPads into the mix, and what changes? I'd argue, not that much. We don't need to worry about being dinosaurs when the roll-out happens, because our students still very much need us. Yes, they are adept at using technology to make social connections. Yes, they have been immersed in technology since birth. Yes, they are comfortable with being plugged in, and most (not all) are curious, excited to learn, and flexible in their approach to problem solving with a device in their hands, even if they're sometimes klutzy about it. Now it's our job to teach them to use the iPads for learning. It's our role to guide them to be purposeful, conscious, and appropriate; to use the devices to find information, figure out relationships between ideas, communicate with precision, and become critical thinkers and problem solvers. This case of nerves about the technology? We've got less than two weeks to get over that. Our students still desperately need us to teach them the same things that have always mattered: curiosity, clear thinking, perseverance, and how to communicate and connect with others.